Includes a PDF Help Line Resource Guide and a Note Read by the Author. Theodore Finch isn’t a normal kid. He likes thinking about ways to die, changing his personality, and Violet Markey—not necessarily in that order. Violet Markey would be a normal kid if her older sister hadn’t just died in a car crash. Finch and Violet meet on the ledge of their school’s bell tower and save each other from themselves. But can both of them really be safe in the long run? Beautiful, poignant, and mesmerizing are three words that could most definitely be used to describe this book. The language is lovely, the situations are heartbreaking and real, and the whole book is a mess of soggy tissues waiting to happen. But while All the Bright Places is a beautiful read, it does come off as almost too beautiful at times. Finch and Violet are in some terrible situations, yet they’re still able to quote poetry and share dialog that seems to be way above a teenager’s level of communication (The Fault in Our Stars, anyone?). Despite this excessive amount of beauty, you get to read about two characters who deserve to have their story told. Finch needs someone to hear him and Violet needs someone to vent to. And while Finch’s story is perhaps the more mesmerizing of the two, Violet still manages to capture your interest as the book goes on, primarily due to her character growth. These two have to navigate their way through a town that either thinks they’re freaks, or pities them, and it’s not always a pretty picture. 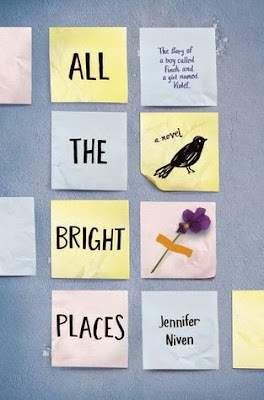 All in all, this book is perfect for fans of The Fault in Our Stars or any other deep and moving young adult novel. *Note: I borrowed a copy of this book to review for Book Review Board of Missouri. This in no way altered my opinion/review.